Keep your taste buds guessing with our Turkey Jerky variety pack. We combine high-quality, lean turkey with bold and delicious flavors to make sure each bite is satisfying and memorable. Try five of our one-of-a-kind flavors with the Variety Pack: More Than Just Original, Tasty Teriyaki, Hot and Bothered, Sweet and Snappy and Jammin' Jamaican. Plus, our turkey jerky is only made from the finest ingredients and is nitrate free, gluten-free and never includes MSG, so you can feel good about every delicious bite of Perky Jerky that you enjoy. Take our 2.2-ounce bags with you wherever you go. TENDER TURKEY JERKY ⎼ Never tough and always tender, our turkey jerky is marinated overnight in a blend of all-natural ingredients for a bold taste and tender texture unlike any other. PORTABLE SNACKING ⎼Take your snacking wherever you go. Our 2.2 ounce bags fit in your purse, gym bag or pocket, so you can enjoy healthy snacks on-the-go. 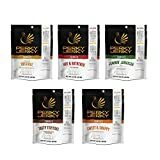 Perky Jerky Variety Multi-Pack Turkey Jerky (2.2 oz, 5 pack) out of 5 based on ratings.